1. ANSWER D– As charge nurse, y ou must assess for the performance and attitudeof the staff in relation to this client. After gathering data from the nurses, additional information from the records and the client can be obtained as necessary. The educator may be of assistance if knowledge deficit or need for performance improvement is the problem. 3.ANSWER A –Antidepressants such as amitriptyline can be given for diabetic neuropathy. Corticosteroids are for pain associated with inflammation. Methylphenidate is given to counteract sedation if the client is on opioids. Lorazepam is an anxiolytic. treated with anti-seizure medications such as carbamezapine (Tegretol). Phantom limb pain usually subsides after ambulation begins. 5.ANSWER D- In supervising the new RN, good performance should be reinforced first and then areas of improvement can be addressed. Asking the nurse about knowledge of pain managementis also an option; however, it would be a more indirect and time-consuming approach. Making an ote and watching do not help the nurse to correct the immediate problem.In-service might be considered if the problem persists. 6.ANSWER C– The Faces pain rating scale (depicting smiling, neutral, frowning,crying, etc.) is appropriate for young children who may have difficulty describingpain or understanding the correlation of pain to numerical or verbal descriptors. The other tools require abstract reasoning abilities to make analogies and use of advanced vocabulary. 7.ANSWER C– The client must be believed and his or her experience of pain must be acknowledged as valid. The data gathered via client reports can then beapplied to other options in developing the treatment plan. delivered; however, the pump will limit the dosage that can be delivered unless the parameters are changed. Intraspinal administration requires special catheter placement and there are more potential complications with this route. Sublingual is reasonably fast, but not a good routefor titration, medication variety in this form is limited. 9.ANSWER A– the goal is to control pain while minimizing side effects. For severe pain, the medication can be titrated upward until pain is controlled. Downward titration occurs when the pain begins to subside. Adequate dosing is important; however, the concept of controlled dosing applies more to potent vasoactive drugs. 10.ANSWER B– Use of heat and cold applications is a standard therapy with guidelines for safe use and predictable outcomes, and an LPN/LVN will be implementing this therapy in the hospital, under the supervision of an RN. Therapeutic touch requires additional training and practice. Meditation is not acceptable to all clients and an assessment of spiritual beliefs should beconducted. Transcutaneous electrical stimulation is usually applied by a physical therapist. 1 drugs and adjuvant drugs as needed. Step 3 includes opioids for severe pain (replacing Step 2 opioids) and continuing. Step 1 drugs and adjuvant drugs as needed. 12.ANSWER D– at greatest risk are elderly clients, opiate naïve clients, and those with underlying pulmonary disease. The child has two of the three risk factors. 13.ANSWER A– This client has strong beliefs and emotions related to the issue ofsibling addiction. First, encourage expression. This indicated to the client that the feelings are real and valid. It is also an opportunity to assess beliefs and fears. Giving facts and information is appropriate at the right time. Family involvement is important, bearing in mind that their beliefs about drug addiction may be similar to those of the client. 14. ANSWER C– Diaphoresis is one of the early signs that occur between 6 and 12 hours. Fever, nausea, and abdominal cramps are late signs that occur between 48 and 72 hours. 15.ANSWER A– The nursing assistant is able to assist the client with hygiene issues and knows the principles of safety and comfort for this procedure. Monitoring the client, teaching techniques, and evaluating outcomes are nursing responsibilities. 16.ANSWER D– the charge nurse is a resource person who can help locate and review the policy. If the physician is insistent, he or she could give the placebo personally, but delaying the administration does not endanger the health or safety of the client. While following one’s own ethical code is correct, you must ensure that the client is not abandoned and that care continues. 17.ANSWER B– Complete information from the family should be obtained during the initial comprehensive history and assessment. If this information is not obtained, the nursing staff will have to rely on observation of nonverbal behavior and careful documentation to determine pain and relief patterns. lower cost and ease of administration. Oral route is also less painful and less invasive than the IV, IM, subcutaneous, or PCA routes. Transdermal route is slower and medication availability is limited compared to oral forms. 19.ANSWER D– Assess the pain for changes in location, quality, and intensity, as well as changes in response to medication. This assessment will guide the next steps. concentration. TENS is more appropriate for chronic muscular pain. Theadditional stimulation of massage may be distressing to the client. 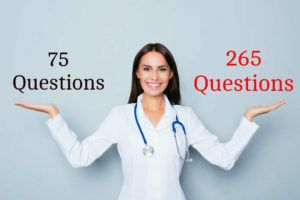 22.ANSWER B, C– The clients with the cast and the toe amputation are stable clients and need ongoing assessment and pain management that are within the scope of practice for an LPN/LVN under the supervision of an RN. The RN should take responsibility for pre-operative teaching, and the terminal cancer needs a comprehensive assessment to determine the reason for refusal of medication. 23.ANSWER C– When a client takes aspirin, monitor for increases in PT (normalrange 11.0-12.5 seconds in 85%-100%). Also monitor for possible decreases in potassium (normal range 3.5-5.0 mEq/L). If bleeding signs are noted, hematocrit should be monitored (normal rangemale 42%-52%, female 37%-47%). An elevated BUN could be seen if the client is having chronic gastrointestinal bleeding (normal range 10-20 mg/dL). client will be time consuming and may cause the new nurse to fall behind. TheHIV client has complex complaints that require expert assessment skills. The client pending discharge will need special and detailed instructions. 25.ANSWER C– directly ask the client about the pain and do a complete painassessment. This information will determine which action to take next.